I am very happy to be let you know that we have just released Fast video cataloger 6 with lots of changes and improvements. To make sure everyone gets a chance to test it out we have reset all trial periods. If you tried an earlier version you can still give this one a test. We have added the option to automatically extract metadata from video files. On the video index screen, you can now decide if you want to extract metadata from nfo files and/or from inside videos. Extracted metadata will be stored as extended properties and you view them in the video detail window. The new ctrl+I search function will match against extended properties as well allowing you to include codecs, video resolution and more in your searches. The search video functions have gotten a new interactive search field (search all). This search field allows you to quickly match a number of the different fields for your search terms. Each term is matched against name, path, description, keywords and custom video properties. If you enter more than one search terms each term needs to match the video but it does not need to match the same property. This is a very powerful feature that will help you to quickly filter down to a few videos in large collections. For example, if you would search for “c:\ brother” the search would match all videos with the keyword “brother” with a path starting with “c:\”. But it would not match videos in other folders or videos in the c:\ folder that don’t have the “brother” keyword. I hope you see how this can be very powerful. We also added a special shortcut “Ctrl + i” that will toggle this search text field up in the top window bar regardless of what windows you have open. When you install this version the first thing you will notice is that we have made quite a huge change to the user interface. No need to worry, you can still configure your user interface across one or more screens just as before. The changes are designed to make the program easier to understand for new users and more efficient for experts. The interface now works a bit more like how it’s done in Microsoft’s office software. There is a start page, “catalog”, where you do things like open catalogs, import/export catalogs, archive catalogs, repair, backup and protect catalogs and so on. These are all very powerful functions that are done on the complete catalog but rarely and this is where you switch between catalogs. By moving these functions to the catalog screen we get rid of quite a few items from the menus which makes them simpler. We also moved to task menus instead of drop-down menus. This has allowed us to save some space and leave more area for the windows. It also lets you quickly toggle windows to configure your layouts and switch between them. We have changed how the default layouts work. The named layouts now have been setup so that their name makes sense. i.e. the add videos layouts by default only have the windows you need to add videos. If you reset that layout it will return to these windows while before it returned to the standard layout. You can still change all of the layouts to your liking and quickly switch between them. We added the ability to change the default shortcuts in the program. You can access this window from the “Catalog” screen. The scripting interface has been extended with functions to mask and unmask videos. Special folders can be accessed from preferences and allow you to set labels to root paths that will be used in the catalog. If you then change the root of videos, say from one drive to another, you can simply just update the special folder label. The license system has been updated, unfortunately, you will need a new key for this version. If it is less than 2 years since you bought Fast video cataloger you are entitled to a free upgrade. If you have already gotten a new key please contact support and we will work that out for you..
We will eventually provide an affordable solution for customers who is running very old solutions from more than 2 years back. Just contact us if you are in a hurry to get the latest version. You can download the latest version of Fast video cataloger 6 from here. In this version, we also reset the trial license so even if you have tested the program before you get a new trial period, and we have extended the trial from 7 to 30 days. Fast video cataloger (https://videocataloger.com) lets you build a quick and searchable database out of video metadata. The video database allows you to get a quick overview of lots of videos without the need to have the actual large video files available. It also lets you quickly search and browse for videos in your database. You can download the software from here; https://videocataloger.com/download/. When you add a list of videos to fast video cataloger it will get metadata for the videos in a number of ways. First, you have the option to add your own metadata. Enter any keywords, actors or other metadata in the “add video” window. Entering it here allows you to easily set shared metadata to a number of files. You can add more metadata later if you want to but this is a quick way to add the info you might already know about a batch of videos you are adding to your video catalog. When you start adding the videos Fast video cataloger will automatically scan through the video and extract thumbnails and store them in with your video catalog. 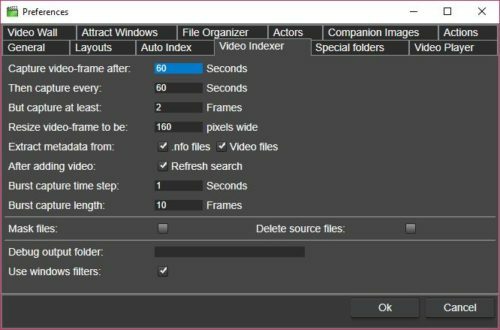 After scanning your video for thumbnails the program will search for an nfo file. If it finds an nfo file, it will read it and add the video metadata to your catalog. nfo files are expected to have the same name as the video file but with the .nfo extension. Fast video cataloger will also scan the video folder for cover art and companion images based on the setting in preferences. What is an Nfo file? An nfo file is a plain text file. The metadata in the nfo file is stored as xml data. You can easily view the content in any plain text editor like notepad. In windows, nfo files are normally associated with system information. Therefore if you double-click an nfo file you will open the wrong program, right click and select open with and choose notepad. What video metadata is read from an nfo files? nfo files can contain a whole lot of different metadata. Fast video cataloger scans the nfo file for a description of the video which is used for video description, keywords that will be used to tag the videos and links to be stored in as a video link. How to get nfo files? Nfo files can be generated from a number of different programs like Kodi home theater, Plex Media Server and many more. If you are moving from any of these popular programs or are using them together with fast video cataloger you can easily export nfo file and get your video metadata into fast video cataloger. Where does fast video cataloger store video metadata? Fast video cataloger always stores its metadata in the catalog database file. I.e. it never stores video metadata in the video file. The reason is speed and the fact that there is no standard for how to store metadata in video files. Some file formats do not allow it, some do, and it all depends on the video file container. Another good reason to not store the metadata in the video file is that it might already contain metadata that you do not want to overwrite. Tagging videos and video scenes with keywords is a powerful way to make your video collection more browsable and searchable. There are muliple ways of adding keywords and in this video we look at tagging video and scenes one at a time. When you are working on adding keywords to your catalog I suggest you set up a layout that fit your need in your workflow. For the purpose of this video I use a simple setup with the Keywording window, the video player, the video catalog and the scenes window. It is very likely that a different setup fit your purpose better. Some customers working with educational videos use two screens and keep one for video scenes only and the other for keywording and video catalog. The video is about a minute long so if you are not using keywords yet this is your chance to get started fast. What is a video bin? Video bin is a new feature that we added to Fast video cataloger 5.02. A video bin is a virtual video folder in your catalog. Just like a folder on your computer you can add videos to it and you can easily browse all videos in a bin. And why would you want to use a video bin in Fast video cataloger? We added bins to help with workflows and reduce the number of temporary tags. 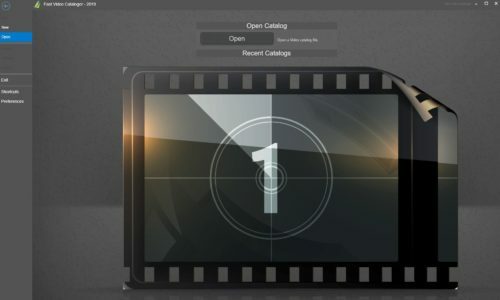 Our intention is that you should be able to use video bins for video favorite lists, for temporary storage when working with videos, as steps when you automate with scripts and more. Many of these use cases could be solved before with special keywords. For example if you wanted to convert a number of videos you could add a keyword to all videos to be converted and then just remove that keyword when you converted the videos. Video bins is another, sometimes superior, way to do the same thing. In this example, create a folder “to be converted”, move all videos you want to convert to that bin. What are the advantages of the bin workflow? If you compare the above keyword workflow to the bin workflow the bin workflow has two advantages. First you do not clutter your keyword ist with temporary keywords, an uncluttered keyword lists makes it easier and faster to find the keywords you need ( remember that you can use color on keywords to make it even quicker to find the keyword you are looking for). The second advantage is that you can have the bin Window open at the same time as the video catalog. That way you can easily use search to filter video and just drag them over to the bin step by step. Ok, how to I create video bins? Open the Bins Window from the windows menu. In the bins window there is a button at the upper right corner to manage your bins. Click this button to open up the bins dialog and from here you can create new bins. When you created the bin from the dialog you can close it. Next, select the bin from the dropdown list in the bins window. Now you have an active bin and can just drag videos from the video catalog window to the bins window. Select videos from the bins window by clicking on them and the rest works just like you would expect. In Fast Video Cataloger 5 you can now easily add your own custom properties though the Extended video properties feature. You access this new feature from the video details window. We think the extended video property feature will be very useful in a number of common business settings. It allows you to use Fast video cataloger for solutions we didn’t knew about when we created the program. Extended video properties is especially useful when you create custom solutions with Fast video cataloger. 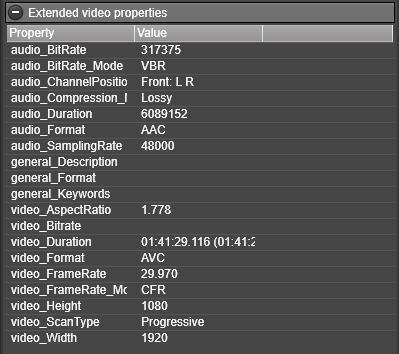 Using extended video properties together with scripting allows you to store per video data. We recommend to use the default properties when they are available. Many things can be expressed with the default fields and keywords. If you have not updated to the 5.x version of Fast video cataloger you can do so from the download page. The video keyword manager is a new dialog that give you a number of functions that will save you time. We added this functionality in Fast Video Cataloger 5. If you have not updated to the 5.x version you can always get the latest version from https://videocataloger.com/download/. It is worth giving it a test as it can save you quite a lot of time when working with your videos. Here is a short video presenting the new video keyword manager. If you have not already doing it… I highly recommend starting to use color for your keywords. Colors makes it much quicker to find the keyword you are looking for when you have a large video collection with lots of keywords.